Yesterday TVLINE divulged that FRINGE show runners have released a limited amount of copies of Walter's favorite 1970's [fictional] band, Violet Sedan Chair on VINYL at random independent record stores across the US! This promotional marketing stunt goes further as each record is "unique" and all of them are full of clues, spoilers, and easter eggs in anticipation of FRINGE's return on the 21st, where Back to the Future star, Christopher Lloyd, guests stars as the key board player of the band. In addition it seems the show runners also hired a real band to play the fictional band and TVLINE seems to imply who they really are might also be cool treat! So I thought in light of this, the spoilers, clues, and easter eggs that come from this band's album(s) should all be posted in one place! So if any one gets a hold of one of these, knows someone whom has, or finds information on a blog or something, feel free to share it with us here! WALTER: I don't want to go to a hospital. I need Violet Sedan Chair. ASTRID: Walter, you're not making any sense. In Addition in the comic book prequel, it was revealed that Walter told his psychologist at St Claire's, that he and William Bell built a time machine at the same time the Nazi's did, that they time traveled to Nazi Germany, met Walter's father, and they escaped by sending Hitler back in the other time machine to the time of the Dinosaurs (which ironically is now also the time of "The First People": However, it might be possible that the time in which Walter and William travel may not be the past of their universe, but possibly the other's history, as there are a few things that could lead someone to believe that. PETER: Yeah. Walter wanted to stick around and wait for the results, but there's Walter on drugs, and then there's Walter on drugs. I had Astrid take him home. You see the look on his face when we were talking to Mister Slater? What do you think that's like for him... wishing that he could turn back the clock to before he went crazy? He's just sane enough to realize how much he's lost. It turns out in Northwest Passage one of the bands Walter listened to (and you can see the back of the album) was Violet Sedan Chair with song titled, "She's Doing Fine". Fringepedia says it's available on iTunes, but I couldn't find it. Last edited by DarthLocke on Sun Jan 09, 2011 8:16 pm, edited 2 times in total. Yeah, I've come up dry in the California bay area and my friend came up dry in Florida. Someone from Texas twittered that Texas was dry as well. There is a twitter feed, violetsedanchia, that seems to be for the band but it does say it's unofficial. They did post a pic of Walter holding an album cover but I don't know if that was taken from a previous episode or not. Someone also mentioned that the band name is an anagram of Olive Can Read This. I hope this isn't a big hoax, I haven't been this excited since DCaaPB. I love these games! They posted a new vid to youtube. deneph wrote: Yeah, I've come up dry in the California bay area and my friend came up dry in Florida. Someone from Texas twittered that Texas was dry as well. There is a twitter feed, violetsedanchia, that seems to be for the band but it does say it's unofficial. They did post a pic of Walter holding an album cover but I don't know if that was taken from a previous episode or not. Someone also mentioned that the band name is an anagram of Olive Can Read This. I hope this isn't a big hoax, I haven't been this excited since DCaaPB. I love these games! Cool Thanks! That's a cool anagram! I noticed in the youtube video the logol with the "Eye" and the infinity symbol with in the delta with the words, "[Time Agents Are Operating In This Area"] You are safe and have nothing to fear, full disclosure." And they show a drawn circle that has the words 'the end' at the left, which is either saying the end is the beginning, or is just a nod to Asian culture because they read right to left and back to front...The video neat regardless! This morning I also posted the official press release for the upcoming episode, "Firefly", in which Lloyd appears...they say that his character some how "over laps" with Walter's life in some way....I have to wonder if this wild goose chase for this band and album in not meant for our universe, but rather a way for FRINGE to google themselves some buzz?? I hope I'm wrong, but I dunno about this. Last edited by DarthLocke on Sun Jan 09, 2011 8:06 pm, edited 2 times in total. I've been contacting all of the independent record stores I can find in Iowa. Nothing so far though I have a few emails that are yet to be returned. One of the things that we discussed-- Deneph and some others and me, included-- on facebook is the potential that many if not most of these records are lost to the winds. The release claims that the records were sent out "months ago" which is quite troubling as many of them were likely bought be people who many never know what they have. Hopefully, we'll get a breakthrough soon! bygnerd wrote: I've been contacting all of the independent record stores I can find in Iowa. Nothing so far though I have a few emails that are yet to be returned. One of the things that we discussed-- Deneph and some others and me, included-- on facebook is the potential that many if not most of these records are lost to the winds. The release claims that the records were sent out "months ago" which is quite troubling as many of them were likely bought be people who many never know what they have. I find that troubling too! Why would they put it out SO early? Why not wait a little closer to the episode, or have let us known a little sooner? Oh well, like you said, hopefully we will figure out something soon enough! This is quickly becoming very disappointing. Yes, it's a boost for the show which is great but there needs to be some meat to this whole thing. Fox, JJ - throw us a fricken bone here! deneph wrote: This is quickly becoming very disappointing. Yes, it's a boost for the show which is great but there needs to be some meat to this whole thing. Fox, JJ - throw us a fricken bone here! What else sort of bothers me is what the anagram means..."Olive Can Read This"
It suggest she can 'read' or understand something that others can't, very similar concept to her being able to see objects that glimmer from the other side. So I could see it referring to over there again, and/or (depending on where and when these people are from) she might be able to read either "the first Peoples" and/or (once again depending if the two are the same or related) The Observers text/language. It would be a real crime to throw us something that we, in this universe, can't get our hands on. Can You Read This? Can You Read This? Can You Read This? Can You Read This?Can You Read This? Can You Read This? Can You Read This? Can You Read This? Can You Read This? Can You Read This? Is Olive Can Read This the only applicable anagram though. Maybe it's Olive Cant Read His. I'm trying an anagram solver (a couple actually) with no luck. Maybe it's Olivia Has Net Cred. DarthLocke wrote: Cool Thanks! That's a cool anagram! I noticed in the youtube video the logol with the "Eye" and the infinity symbol with in the delta with the words, "[Time Agents Are Operating In This Area"] You are safe and have nothing to fear, full disclosure." And they show a drawn circle that has the words 'the end' at the left, which is either saying the end is the beginning, or is just a nod to Asian culture because they read right to left and back to front...The video neat regardless! A customer was trying to return a record of Mathew Jonson – Agents of Time claiming fraud. After opening the record he found that the actual album and jacket was from some “seventies ****ing nobodies!” and that a paper liner masked the true album to make it look like the Agents of Time album. The owner replaced it with one off the shelf and made the guy open it right there first (and it was the genuine agents of time record and jacket, no fake paper coving a different album). Everyone at the store felt it had to be some type of joke either at the store or at the distributors. I’m 99% sure this ended up in the dumpster (but I’m asking first thing when they open in the morning just in case)!!!!!! Do you see? Agents of Time! Just as in "[Time Agents Are Operating In This Area]" Could it really be a coincidence? Its the perfect plan to distribute maybe 20 albums nationwide yet not let on that they are rare (if the distributor did then the record shop owners would keep them themselves to ebay later). I would bet there is a way to differentiate the real Agents of Time album from a fake one containing Violet Sedan Chair. A symbol on the fake jacket? Was the paper that lined the jacket thick enough where a person could notice the difference? Maybe Matthew Jonsons "Agents of Time" is the record we should be looking for!? That's really cool story! That would be sweet! ---That maybe there is a legit reason we can't find the album, and this sounds like a good one. --I have to go re look at the spoiler posts again, but I also remember that the first episode back was suppose to be mythological as well, semi-Observer-centric.....so if I did remember right, then the band, the Observers (who we could call time agents--hence the nod to Back to the Future, which they were seen outside a showing of it in 1985 in the red universe, but it seems pretty clear they reality travel, but I also imagine they time travel --hence the change in speed at which they travel in "August"), with Christopher Lloyd guest star could very well make perfect sense! OK even weirder still. I went to look up the MJ's Album for the track lists and there were some tracks that kind of seem Fringe-y.....but number 5 did me in. 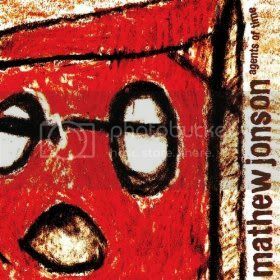 Continuing the Mathew Jonson train of thought....I went to look up his album on amazon & the "Agents of Time" album cover sort of reminded me of something....Bad Robot, JJ Abram's production company. Can't wait for this episode, I'm a huge fan of Back to the Future trilogy! Location: In front of my computer, as usual. 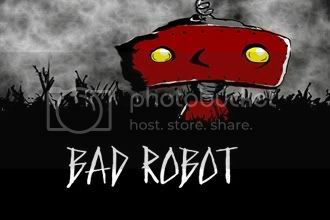 It does look like "Bad Robot"! Oh, and there's a deleted scene from Fringe's season finale last year, where this band was playing in the background, and someone ran the whole scene backwards and there's this whole weird conversation between Walternate and Peter talking about the Earth being an innocent victim. I am so excited! Thank you FRINGE Show Runners for meaning what you say! Here is a link to the LP for LISTENING!